Monsanto private studies are the reason the European Union re-licensed cancer-linked glyphosate for another five years back in 2017, but the company has been fighting tooth and nail to keep these studies secret. Monsanto’s infamous toxic weedkiller is responsible for deaths from cancer say claimants across the world, and yet the USA continues to licence the sale of this cCarcinogenic product, which is just one example of how a Trade Deal with the USA could result in lowering of safety standards. 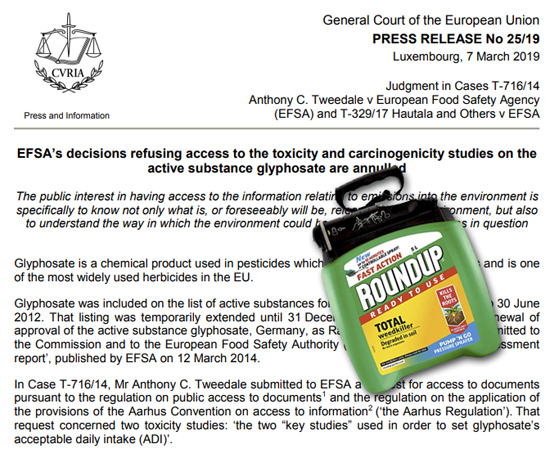 Independent scientists, say campaigners, need then to sift through the bogus Monsanto research and prove once and for all: the EU should immediately ban glyphosate! But it is really incredible that despite being given a reprieve by the EU in 2017, that not even our MEPs have seen the Monsanto studies – a situation which mirrors that of the tobacco industry some 50 years ago!! Until now, the European Food Safety Authority refused to give anyone access -- saying that it “could harm the commercial interests of companies that presented the studies”. Monsanto clearly doesn’t want anyone -- least of all credible scientists -- to take a closer look, because it would mean the end of its toxic, cancer-linked weedkiller in Europe, and then around the world. But the court ruling changes all this, although one can expect that Bayer-Monsanto will do all it can to frustrate the will of the European Court of Justice. Campaigner say that this is their last chance to ban glyphosate for good -- and get the EU to do a U-turn on its license of glyphosate and get Monsanto’s toxic pesticide banned for good.